You can get discounted rates from major car rental companies, such as Thrifty, Budget, Europcar, Hertz, Avis and Britz, or local Melbourne car hire, where you can even rent a ‘bomb’. There are car rental Melbourne pick-up locations are around the CBD and Southbank, and you can hire a car at Melbourne airports, Tullamarine and Avalon. You generally will need to be at least 25 years old to rent a car in Victoria. However for those under 25, there are outlets that will hire cars to you, subject to extra surcharges. You can get last minute discount car rental. However, in most instances, you will get better prices by booking at least a few days in advance. Booking ahead of time is a must during peak holiday times and Melbourne events. For the very best car rental Melbourne Australia deals consider hiring your car from one of the independent intermediate companies – who negotiate a large range of major car rental company cars at discounted rates. We recommend VroomVroomVroom, who are very professional and allow you to easily compare prices. They also provide a not-to-be-beaten price promise. Check out their rates below. Note: you tend to get cheaper rates chosing the Southbank pickup - which is just across the Yarra - and can make quite a difference to your budget! Australian car hire rates include basic insurance. You are not required to buy any extra if you want to keep your cost down. However, if you damage the car the Melbourne car rental companies will charge you an excess. This varies from company to company and can be up around $5000, which can make you nervous getting on the road. You can purchase excess reduction directly from the car hire companies. This reduces the excess to a much lesser rate. However, it does not come cheap and can cost you up to $40 per day, and as such is only a viable option for short car rentals. For longer car hire you can take out travel insurance that will cover your excess, as well as medical insurance and luggage. This is much cheaper if you are hiring a car for more than a few days. However, you will have to cover the excess first and then claim it back through the insurance. Check 1cover for a good deal on travel insurance. Will you Need a Car in Melbourne Australia? If you just want to explore the inner Melbourne you won’t need to hire a car. Public transport will get you around the inner city. However, to visit the many of the attractions around Melbourne, it is very handy to have a car. You will be independent and don’t have to rely on tour operators or slow public transport connections. With a car you can go on many interesting tours and day trips. You can visit the Penguins in Phillip Island, the great Ocean Rd, the Yarra valley or the Dandenongs, and get to see more. To see Australian, a car or campervan will give you the independence to travel at your own pace and leisure, to stop where it suits you and to get to some far out locations. For the purpose of travelling between major cities, car rental Melbourne is a good option, if you are travelling with two or more people. You can return the car to any other city at the other end of your journey. Just remember to drive on the left side! Car Rental or Caravan Hire? 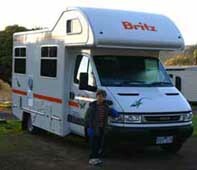 If you want to experience the Australian bush, beaches or National parks, consider campervan hire Melbourne. This way you can pull up almost anywhere and have the comfort of a bed and cooking facilities without having to put up a tent and unpack. But even with these, it is more comfortable to stay the night in a caravan park where you can plug into power. However, campervans can be bulky, chew up more petrol and are more difficult to negotiate on narrow or steep roads. If you don’t want to go bush, hiring a normal car may be your better option. They are cheaper and easier to drive. That way you can stay anywhere, from a cabin, to a bed and breakfast, or boutique hotel while enjoying getting around easily. Sometimes you can get a car or campervan from car rental Melbourne companies that needs to be relocated to another city. If you look around, there are deals where you pay next to nothing for the car for a few days – or even get paid a petrol allowance if the company wants it back urgently! Car and campervan relocations are available from many rental companies. We brought a campervan back from Hobart, Tasmania to Melbourne over a few days, crossing the Tasman on the Spirit of Tasmania ferry. This great adventure cost us next to nothing by doing it as a relocation. Here are some tips for negotiating hire car through Melbourne: Avoid Melbourne peak hour traffic. Melbourne gets congested for a few hours in the morning, and also between 3:30 and 6:30 pm in the afternoon. Watch out speeding or chasing a green light! Melbourne and Victorian traffic authorities keep the thumb on their drivers through many red-light and speed cameras. Getting out of town is easy on one of the freeways or citylink connections. Check on hiring your car if you need to use toll roads. Once you are out of the city traffic will not be a problem.Also, be aware of some unique road rules that apply in metropolitan Melbourne.